Picking my favorite female superhero and writing about why I idolize her was a difficult assignment to get started on — my head was empty of ideas. Rather than adhering to the exact super-heroine topic, I decided I should just go with free-style stream-of-consciousness writing (as opposed to investing hours of time researching and crafting a grammatically perfect and succinct on-topic treatise). That is, I am just going to Move-Girl-GO-with-the-flow. The first thing that comes to mind is Cat-Woman, simply because I am a huge fan of cats. My current cat is particularly enchanting, and I have been hoping for an opportunity to be able to somehow mention her in my MoveGirlGO writings. My cat wears a super-hero costume of pure white fur with eerie light green-yellow eyes. She is a stray of unknown origins, presented herself at my door, and won my heart — that’s kind of a super-hero story-line. I have dubbed her: Pallorina, Princess Ghost Kitty — which surely qualifies for super-hero status. Moving along, I’d like to acknowledge Snow White as a super-heroine — she confronted and conquered males representing some bad qualities that we females often encounter: Grumpy, Sleepy, Bashful, Sneezy, Dopey . . . 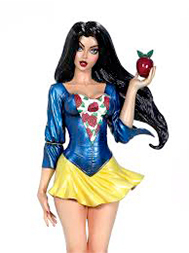 However, contrary to Snow White’s experience, please remember that juicy red apples are a good nutritious treat. Recent Snow White movies have morphed Snow White into someone ultra-cool and not-to-be-messed-with. I also admire the Rapunzel heroine, especially as depicted in Tangled, because she’s a super-good reminder of the importance of maintaining a healthy head of hair. Finally, I’m giving a shout-out to the Jessica Rabbit character for being utterly ground-breaking (and because I’m saddened by the recent passing of Bob Hoskins). Hooray – Cat Woman wins the MoveGoGIRL female super-hero popularity contest this week!